One of the more well-known brands in the phone mount biz, iOttie has been around for quite awhile, consistently finding the perfect spot for price and quality to meet. The model I purchased is their top-of-the-line 4th generation “One Touch” mount, with wireless charging built in. At $45, it’s a lot pricier than many of the options out there. This thing is absolutely rock solid. Coming from a 2nd generation iOttie One Touch, the difference is night and day. There is zero flex, zero shake. The adjustment knobs can be loosened move the mount in a near-360° range to help you choose the perfect spot. The mount itself attaches to the arm via a ball head, and you can set the movement of that pivot from loose, to firm, to zero play. 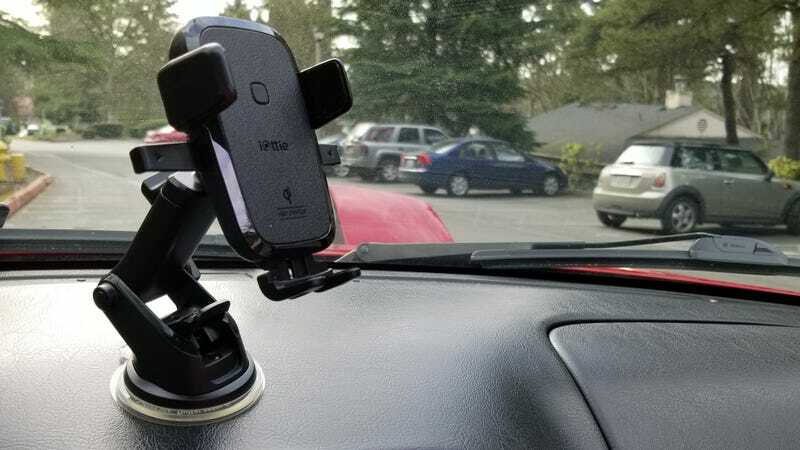 The fact that with my personal in-car setup the mount is fully extended from the suction cup makes the lack of play in the entire system even more impressive. Another improvement over the second gen is the overall effect from numerous minor changes to the “claw” that grips the phone. Before, if I was drifting through the mountains at speed, I would have to keep an eye out for the phone that always came free and attempted to exit the vehicle. This is no longer the case. The grip is much better, and despite the tighter, better designed hold, it’s actually easier to remove your phone with the One Touch system than it was previously. All of that is a bonus, the real reason I purchased this mount was for the Qi wireless charging. I was sick of dealing with cables, and now I get a charge every time I’m in the car just by placing my phone in the mount, which happens every drive anyways no matter how short. Setup was a breeze, and with wireless quick charge (for Android users) the charger managed to outpace battery loss when I had full brightness, screen on, music and GPS playing, with multiple apps in the background. Wireless charging isn’t as fast as your regular corded charger, but it’s still very usable. My 18 minute drive to work brought the battery from 87% to 100% while playing music. LLiterally the ONLY small issue I have is this - the micro-USB connection doesn’t go all the way into the mount, there’s a small sliver of visible metal. Does it matter? No. No one will ever see it, and it doesn’t affect anything. But... Stylistically, it bugs me. I have it set up in such a way that I can control my phone with one finger while keeping my hand on the wheel. It blocks very little forward visibility, and I can snap a picture while keeping my phone mounted with much less attention than it takes to change the heat with a modern infotainment system! All in all, fantastic purchase and well worth the price. If you have wireless charging capabilities, I strongly recommend picking one of these up. If not, the non wireless version is much cheaper, and (presumably) just as well built. I’ve definitely seen kinja deals with this, so keep an eye out. This is exactly what the product names it. A big, convex clip-on mirror. Broadway is pretty well known, I’m honestly surprised I haven’t seen more of YOU with one of their mirrors. They say that their mirror is “3x as clear with a much brighter image and better optical quality.” well.... Broadway ain’t lying. During evening sun, the difference in brightness was very noticeable, which is a great sign for nighttime driving. There’s no dim switch like with an OEM mirror, but you can flip the mirror up if needed. Problem solved. Oh and the image really did look clearer. The best way I can think to describe it is for you to try to compare your current phone screen to your phone screen from five years ago. The newer image is MUCH better, yeah? It’s a quite a bit wider than the OEM mirror, that combined with the convex glass makes for a absolutely massive increase in your rearward visibility. Pictures do not do this justice. I can’t believe how big of an improvement this makes. Ten dollars. This is the 300mm convex, there are also 350mm flat and 400mm flat options. I’m considering testing out a 350mm flat at some point. Again, 10/10 would recommend. Even if you don’t have any rear visibility problems, the increase in clarity is something everyone can benefit from. Oh and did I mention that it’s mad tyte jdm, yo?